This was a bold statement, but as my father used to say , “It ain’t bragging if it’s true” and I believe LeBron was not bragging. In game six of the 2015 NBA finals, James again poured out with 32 points, 18 rebounds, and nine assists, but the Golden State Warriors hoisted the Larry O’Brien Trophy after finishing and the Spurs clinched the 2015 Finals in Cleveland. James shot 13-of-33 from the field and 4-of-8 from the foul line. He recorded his 80th 30-point game in the playoffs and 59th game of at least 30 points, five rebounds, and five assists in the playoffs. James became the sixth player in NBA history to score at least 5,000 career points in the playoffs, joining Michael Jordan (5,987), Kareem Abdul Jabbar (5,762), Kobe Bryant (5,640), Shaquille O’Neal (5,250), and Tim Duncan (5,113). But the key lesson here is….. no matter how great LeBron played, no matter how much his total statistics increased……….. his team LOST. In business, as in basketball, ultimate success cannot be achieved by one person. You can’t do it all and sustain winning. Teamwork is required for long term success, on the court and off. Selecting the right team members who will work effectively together to win is essential. Raw talent is not enough for any team or organization to succeed. Sports teams are built both through skill building practice individually and as a team. In the same way, organizational teams must build their technical, collaboration, and execution skills. Using behavioral assessment such as the Harrison Assessments facilitates the team development process from identifying the right team members, areas of development for individual team members, to creating team developmental competencies. Harrison Assessments offers insightful reports to build a winning team. 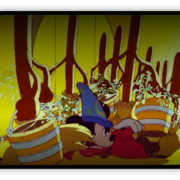 Disney	The Sorcerer’s Apprentice – Talent Management Matters!